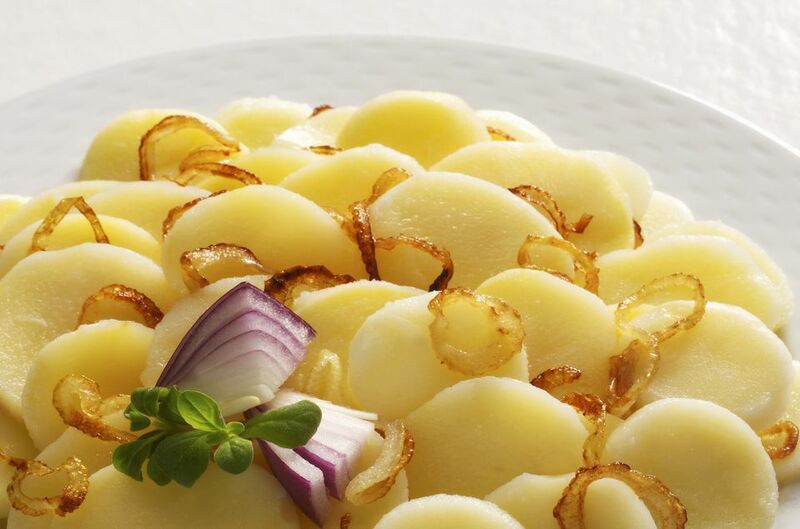 Boiled potatoes with caramelized onions and chopped dill are a favorite at many Polish dinner tables. Families will make a meal of them, especially during Lent, washing them down with a cold glass of buttermilk. This potato dish goes well with pork, chicken, beef, ham, and fish, making it the perfect side dish for almost any meal. This recipe calls for caramelizing onions, which are simple to make, requiring just a few ingredients and a little bit of stirring on the stove. If you happen to have some caramelized onions leftover, by all means, use them in this recipe. If not, you may want to double the quantity called for here and save the extra to add to other dishes during the week. To caramelize the onions, heat the olive oil with the butter in a medium skillet until butter just begins to foam. Add onions and cook over medium heat until they start to brown, stirring frequently, about 10 minutes. Reduce heat to low and continue cooking, stirring occasionally, about 20 minutes longer until onions turn a golden brown. Watch carefully toward the end of cooking time. Sprinkle with sugar, if desired, and cook another minute or two, tossing to incorporate. Set aside. In a large pot of salted water, boil potatoes until tender, 10 to 15 minutes. Drain well, return to pot, and set over low heat for a few minutes to evaporate any remaining water. Remove from heat. Add caramelized onions, salt, and dill. Toss until all ingredients are well incorporated. Transfer potatoes to a serving dish and serve warm. Turning sharp, bitter raw onion into sweet, mild caramelized onions that melt in your mouth may seem like magic, but once you cook them up and incorporate them into other recipes you will become a believer. Turn ordinary dishes into something spectacular, like this chicken smothered with a garlic and caramelized onion, and grilled cheese with caramelized onion. Combined with sweet potato and spinach, this caramelized onion tart is a wonderful appetizer for your next dinner party or gathering. You can also whip up a quick batch of caramelized onion biscuits to impress your family and friends.